1) Please tell us a little bit about yourself, Mister Joseph McCabe? I'm the West Coast Editor of SFX ("the world's leading sci-fi, horror and fantasy magazine"), a reporter for Total Film and Digital Spy, as well as being the author of '100 Things Batman Fans Should Know & Do Before They Die', '100 Things Superman Fans Should Know & Do Before They Die', and the Bram Stoker and International Horror Guild Award-nominated 'Hanging Out with the Dream King: Conversations with Neil Gaiman and His Collaborators'. I've also written and edited for a number of genre and comic book-related magazines and websites over the last two decades. Basically, I write about gods and monsters for a living. 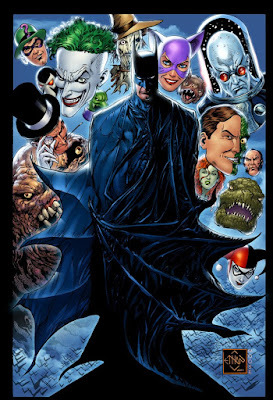 2) What inspired you to create, ‘100 Things Batman Fans Should Know & Do Before They Die’? After writing '100 Things Superman Fans Should Know & Do Before They Die' for Triumph Books, I was eager to do a book on the OTHER world's greatest superhero. Superman and Batman are like my two dads, as they've both been there for me at different times when I've needed them. I've also covered the Dark Knight extensively in film, TV, and comics throughout my career. 3) In your own opinion, what’s the most surprising fact featured in this book? 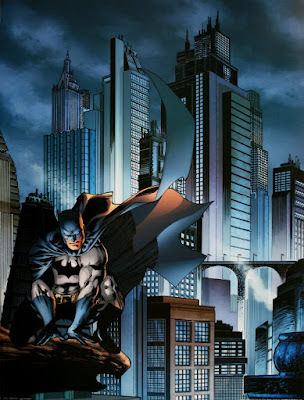 Probably the sheer variety of reasons WHY people consider Batman their favorite fictional hero. Some fans, for example, love his costume, and the many different ways it's depicted. Other folks find inspiration in his origin and how he turned tragedy into triumph. More still can't get enough of his rogues gallery, representing every form of evil imaginable. These are just a few of the reasons the character has endured. 4) What song would you say best represents this piece and why? One song to represent Batman? Hmm. That's a tough one. Obviously, each screen version of the character has his own memorable theme. From Neal Hefti's jazzy spy-fi/surf guitar theme for the 1966 TV show, Danny Elfman's iconic march for the 1989 Batman movie, right up to Hans Zimmer's driving, relentless suites for The Dark Knight Trilogy... they're all outstanding. If I had to pick one, however, I'd go with Elfman's. It's no wonder it was used in Batman: The Animated Series, arguably the definitive screen take on the character. 5) How did you get Paul Dini to write the foreword for your book? I interviewed Paul for my Superman book (for which Mark Waid wrote the foreword) and immediately found him to be one of the most insightful, warm, and humorous creators I've ever met -- he even drives a purple convertible, just like the Joker! Since I'd already considered him the finest living Batman writer, at that point I told myself that if I was ever lucky enough to write a Batman book I HAD to ask Paul to write the foreword. When the book was finally greenlit, to my eternal gratitude, Paul said 'yes'. 6) During your time in this field, what is the one thing that has kept you in good stead? There's a lot of truth to the old saying that to succeed as a freelancer you have to be two of the following three: courteous, skillful, and on time. So I try to be all three as often as possible. 7) If you had a personal motto, what would it be? 'Stay focused and keep moving forward'. The two things that hold human beings back, that keep them down, are guilt about the past and fear of the future. Conquer those two things and you can do almost anything. Just like Batman. 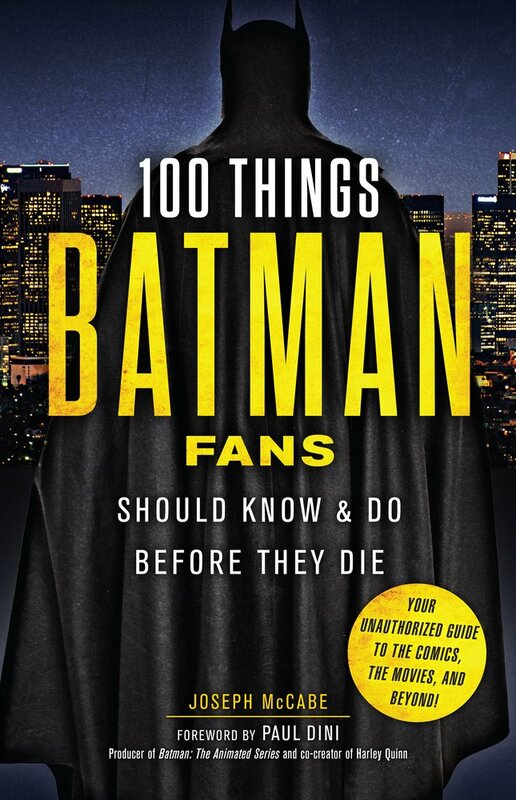 And on that note, I'd like to thank Joseph for telling us about his book, '100 Things Batman Fans Should Know & Do Before They Die', before encouraging you to pick up a copy via Triumph Books or any other online retail outlet. At $14.95, this 256 page book is well worth a look, especially if you're a fan of old big ears.